Water potential (ψ) is the measure of potential energy in water and drives the movement of water through plants. 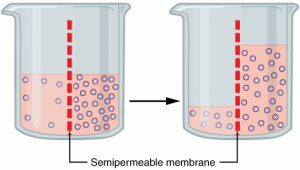 If two solutions of different concentration are separated by a semi-permeable membrane – which is permeable to the smaller molecules but not the larger ones – the solvent will tend to diffuse across the membrane from the more concentrated solution to the less concentrated. Diffusion refers to the process in which molecules intermingle as a result of their kinetic energy of random motion. 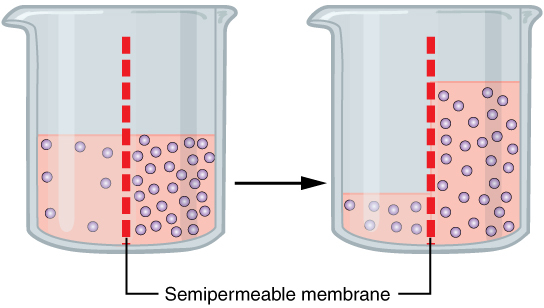 Facilitated Diffusion is a form of passive transport across a biological membrane in which transport protein facilitates (or mediates, or catalyzes) the movement of an otherwise membrane-impermeant molecule, or ion, across the plasma membrane down its concentration, or electrochemical gradient. A solute can move from lower concentrations up to higher concentrations. This process works similar to facilitated diffusion but requires energy to be achieved.